Squeezing this last post in this month before I go on my travels, so there’ll be a hiatus here at TD for a while. I’ve not read Patricia Highsmith before, but had read some very positive reviews of her psychological thrillers, and have seen films like Strangers on a Train (directed by Hitchcock in 1951) and The Talented Mr Ripley. Carol is very different. One morning, into this chaos of noise and commerce, there walked a blondish woman in a fur coat. She went home and wrote up an 8-page story outline in her notebook. This was one of those germs of an idea that Henry James has written about; they simmer in the author’s mind for a while and then emerge as works of fiction. Their eyes met at the same instant, Therese glancing up from a box she was opening, and the woman just turning her head so she looked directly at Therese. She was tall and fair, her long figure graceful in the loose fur coat that she held open with a hand on her waist. Her eyes were grey, colourless, yet dominant as light or fire, and, caught by them, Therese could not look away. The 19-year-old Therese, an aspiring stage set designer, has had a coup de foudre. What follows is a compelling account of a passion that turns out to be mutual, but beset by the hostility and prejudice against lesbian relationships that were prevalent at the time – and still are, sadly, in some places. Carol is a wealthy housewife in her thirties, married but soon to be divorced. Her husband uses the situation to ensure he is awarded custody of their little girl. Therese and Carol go on a road trip out west. They are being followed by a detective hired by the husband. He’s as cynical and unsympathetic as the man who hired him, and the society that spawned them both. The cat and mouse pursuit and suspense that follows is heart-stopping and makes for a compelling read. Carol was played beautifully by Cate Blanchett in the 2015 film (directed by Todd Haynes). Not surprisingly, Highsmith published the novel in 1952 under an assumed name; her usual publisher wouldn’t touch it because of its lesbian theme. Big mistake: it sold over a million copies when it came out in paperback. There’s an excellent introduction in this Bloomsbury edition, by Val McDermid. As she says, it’s ‘a polished and accomplished work’. I recommend it. 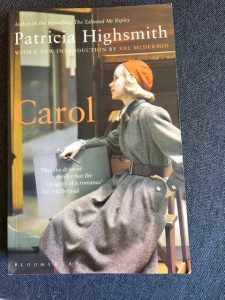 This entry was posted in American Literature and tagged Bloomsbury publishers, Carol, Patricia Highsmith by Simon Lavery. Bookmark the permalink. I need to read Highsmith, obviously! 🙂 Enjoy your travels! Karen: I think you’d enjoy this – and thanks! Simon, I would usually not paste something, but I think the mystery of Highsmith’s artistic “coup de foudre” here is a great example of what David Lodge once talked about when he mused on the creative process. I’m pasting it below, in brackets, then one more observation on Highsmith. Finally, I always marveled at the warmth of “The Price of Salt,” compared to the coldness of Highsmith’s other novels, and her sad life story. Was it the times she lived in? Something in her own nature the led her towards her end as a recluse? Still pondering. Some people have called Highsmith’s writing “cold.” But I think the quality I find strongest in her works is alienation. This is reflected in both her life and her writings. I have, so far, only read the first Ripley, but I have a boxed set and plan on working my way through. Have a wonderful holidays, Simon! Thanks, Paula. 34 degrees in Porto today! I had to google Porto, but, oh, it looks lovely. Wow, Simon. Sounds like a lot of fun. Have you by any chance read much Muriel Spark? “Cold” may be better suited to her work, in the sense that I find her eye, when she persuses the people around her, rather merciless, although terribly accurate and occasionally hilarious. Cheers! Thanks for the compliment, Maureen! I’ve only read “The Prime of Miss Jean Brodie” which is definitely merciless to its characters. Any others of her books that you would particularly recommend? Not that I need any more for my stacks, of course! Hope something suits, Simon and Paula! Thanks from me, too! And thanks for jogging my memory that I had read “Momento Mori.” I found it, if anything, more merciless towards its characters than Brodie. The other two sound right up my alley. Off to add to my pile…. It sounds very good, though I may watch the film first (which I shouldn’t, I know). I liked her Strangers on a Train (I think there’s a review at mine) and loved The Talented Mr Ripley (but only liked its sequels). Re Spark, I’ve reviewed two at mine – A Far Cry from Kensington, which I really liked; and the almost universally acclaimed The Driver’s Seat, which I didn’t (hence the almost there). She’s definitely a cold writer, but a very skilled cold writer. Nice post. I cannot wait to read this one now. I have previously only read The Talented Mr Ripley, but I liked the movie Carol. It is such an injustice the movie did not receive a Best Picture nomination at the Academy Awards.